PERFORMANCES AT THE BCC: One of our biggest goals is to bring more music and theater performances to our Community Center and to create a well equipped and inviting space for our performers and patrons. Bolinas has always had an impressive array of local talent in theater, music, and dance. We have an After School Theater Class B-CAST (Bolinas Children’s After School Theater) run by Artistic Director Lisa Townsend, and a “Theater Workshop” happening intermittently for all ages with actor and screenwriter Patrice Daley. We also host performances almost every year by The Bolinas Bay Performing Arts and Molly Maguire as well as other local Screenwriters and Directors, like Dale Polissar, Jerry Bojeste, and other local theater companies. We want to further encourage these artists and help the community enjoy their talent by creating for them the first-class performance venue they deserve. Years of study and discussion have given us a clear idea of what it will take to do this, and we have organized the results into the five projects outlined below. HALL ACOUSTICS Fall 2011, we covered the stage ceiling with sound-absorbent material, with the result that musicians and patrons both are extremely excited already about the improvement in the acoustics. For years, local bands refused to play on the stage due to extremely poor acoustics. The hall is all wood with no sound baffling (until November 2012), which used to create an annoying echo and excessive reverb for musicians on-stage as well as an enormous bass standing wave in the hall that defies soundboard control. Over the past few years, community member and engineer Dr. Don Smith has volunteered his services, time and a cash loan to help fix the sound problem in the hall. We’ve also obtained input from two outside consulting acoustic engineers. In the fall of 2012, the Point Reyes Dance Palace generously donated their old lights and dimmers to the BCC and we now have a total of 20 lights in the hall. For a long time before that there were only five working theater lights at the BCC. Since many of the lights we did receive from the Dance Palace are old and use too much power we hope to be able to upgrade to some LED fixtures and ETC Source-4 ellipsoidals in the near future. Currently we have: 6 par cans, 8 fresnels, 10 “ColorTran” spotlights, one “Source-4” and 2 odd-brand spotlights. The BCC does not have a real backstage / dressing room. In the past, the kitchen and office have been used; but if an event has food, the kitchen is unavailable. The office stores a lot of sensitive information that shouldn’t be available for anyone to see. There is a small room to the right of the stage that is used as a storage space for tables and chairs. We built an outside storage shed, hoping to hold the chair racks, but we still have to re-do the concrete landing outside to truly get chair racks into it. Instead it is being used for other storage at this time. Having the chair racks in the front storage would open up the space next to the stage to be a “backstage” for performers. We need to still raise money to re-do the concrete landing and we also need to purchase lights, clothing hooks and other necessities for the new backstage area. The stage back curtain we have is dreadfully old, discolored and patched and takes 15 minutes with two people sweating on ladders to roll back up after each use; we need a new and heavier one – for both appearance and acoustics – that is easy to roll up and down. A cyclorama for the stage would also enhance stage appearance significantly, ideally one with the easy roll-up-and-down feature as well. A venetian style back curtain has been quoted at $30,000 by a theater curtain company, which is ridiculous, so we hope to find another way to create the same type of new back curtain. TBD. We are about to embark on a “Technician Training Class for Youth” to teach youth how to use and operate the sound and lighting equipment. 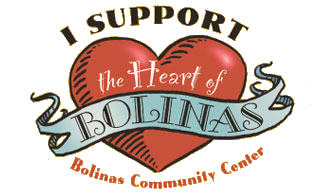 Tiny, rural Bolinas doesn’t have much to offer its youth, and we believe this is a great opportunity, for those so inclined, to learn a fantastic trade in their hometown and even get paid for running gigs at the BCC as a light or sound technician in the future. We have just received a grant for $1,500 from West Marin Fund to make this training happen – if interested in being part, please contact lia@bocenter.org or call (415) 868-2128. Rolling-up gear for curtain & cyclorama $ ? For four years now, I’ve been studying the engineering literature and analyzing our Community Center’s hall to figure out how to improve its performance sound and, more recently, its theater lighting, so that we can properly showcase our bountiful local talent. (See project details at <BoCenter.org>.) I’d like to thank Jeffrey Commons, Charlie Docherty, Zoro Drux, Dirk Epperson (engaged through Don Read), Burton Eubank, Gabe Faure-Brac, Steve Heaslip, Clay Lilleston, Robin Livingston, Jerry Lunsford, Tony Smith, Paulie the soundman for Bonnie Raitt (through Soozie Mills), Derek Tracy, Duke the structural engineer (through Roger Peacock), Peter Turner, and Anthony Wright for donating valuable consultations to these efforts. The hall today displays a lot of progress. Acoustic absorbent on the back wall and stage ceiling have eliminated echo, cut down on boomy bass, and helped musicians hear each other much better on stage. Thanks to Chris Besenty, David Kimball, Steve Wrenn, StuArt Chapman, and Matt Yerington for helping with that installation. To make event setup easier, we’ve had cabinetmaker Nick Bogle build us a beautiful roll-around sound booth (at a tremendous discount), so that instead of two hours of schlepping and wiring for every gig, we just flip the cover and turn it on. Also, the front-hall tower of boxes and snake-pit of cables have been supplanted by an unobtrusive wall cubby for running activity sound and a locked under-stage rack for the big amplifiers. Thanks also to Ananda Brady, Ralph Camiccia, Jeffrey Manson, and Charles Weismuller for helping make that all happen. Lighting got a big boost from the Dance Palace (thanks to Burton again) donating us their entire recently replaced lighting system and from Jeffrey Trotter giving us a bargain on his 24-fader console. New light-mounting pipes installed with the help of Matt again, plus Rick Sherman, will help us hang it all and aim it right. But there’s more to do, including relocating the speakers, installing bass traps, adding microphones, rewiring the lighting power into new dimmers, refurbishing the spotlights, and upgrading the stage. Despite over $20,000 saved using donated labor and equipment, we’re still thousands short and really want to bring the project to a conclusion. Please come to our dinner/dance party project fundraiser this Friday, kick up your heels, and kick in some $ even if you can’t come on Friday. Thanks!